Over the past couple of decades, raku firing has become very popular. The unpredictability of the process keeps potters and ceramic artists coming back to the raku firing technique again and again. 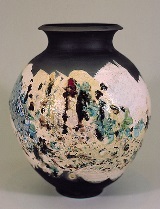 When potter John Ramer Sherrill first started out using the raku firing technique, he was frustrated by the lack of technical information on raku in books. He found that there was plenty on raku philosophy, but little on technique, and he spoke to many other raku artists who had the same experience. So he set out to do some technical writing of his own on the raku firing technique, the results of which appear in our Ceramic Arts Handbook Raku Firing: Advanced Techniques. In this post, we’ll present an excerpt from that text, which addresses raku clay bodies and raku kilns. – Jennifer Poellot Harnetty, editor. A wide variety of clays can be used to make raku pottery. Be aware, though, that the clay used determines much of the character of the finished piece. As a general rule, earthenware clays should be avoided if you like dark, bold crackle effects. The closer a clay body gets to vitrification, the less effect carbon will have on it in reduction (earthenware clays are closer to vitrification at raku temperatures than stoneware clays). Iron content also resists carbonization, so earthenware clays should be avoided. We are then left with the light-colored stoneware clays, and nearly all of these will work well. A stoneware body with just enough iron to give the fired piece a light tan color will have a pleasingly warm appearance. Some of the white-firing clays have an attractive ivory appearance. Experiment with different bodies to find one you like. the body color is usually anemic; besides, with ordinary-sized pieces, most stonewares survive the firing as easily as raku clay. Suppliers also usually have bodies that are designated as “ovenware” clay. These clays, which contain less grog (easier on the hands), often make an ideal raku body. I use ovenware clay almost exclusively. Because red-hot pots are removed from the kiln, it is apparent that many models simply are not appropriate for raku firing. Large kilns of any type, when opened at temperature, radiate heat so fiercely that it would be foolhardy to attempt raku firing. Top-loading kilns are also impractical, as you must position yourself above the kiln in order to reach inside, and the rising heat would be overpowering. Small (2 cubic feet or less) front-loading electric kilns may be used, but most raku firing is done in gas kilns especially constructed for that purpose. They can be purchased commercially, or they are easily homemade. artists, body, carbon, ceramic, ceramic artists, ceramic arts handbook, clay, clay bodies, clay body, color, colored, crackle, earthenware, experience, feet, firing, firing clay, firing kiln, firing process, firings, glaze, glaze melt, glazes, grog, heat, homemade, information, iron, kiln, kyanite, loading, models, open, patterns, pieces, position, pot, pots, potter, potters, pottery, process, raku, raku artists, raku clay, raku firing process, raku pieces, raku pottery, raku sculpture, raku vase, reduction, reflective, results, sculpture, set, stoneware, suppliers, surface, surfaces, technical, technique, techniques, the raku, time, vase, warm. As a permanent amateur potter, I found this post valuable. My question is specific and off-the-wall…. but, here goes. I have quite a bit of “raku” clay and no access to raku firing. Given that the clay functions like earthenware (low fire) but with special thermal properties, could it be used to make small food containers? No, I am not talking about raku firing, just the clay. I would like to use what I have in making small container to set yogurt which in India used to be set in earthenware. The porous quality actually helped the yogurt become firm and very tasty. I picture making the pot and two firings, one for bisque at cone 04, then another after 1) with a good burnishing outside at cone 06 without any glaze or, 2) a food-safe cone 06 glaze. This like some plant pots would allow porosity on the inside and help with water absorption for making good yogurt. These types of earthenware pots are still used in India today to cool water without the benefit of refrigeration. SO, PLEASE ADVISE. DOES ANYONE SEE HEALTH RISKS IN USING RAKU CLAY LIKE EARTHENWARE? The archives should have lots of plans to build a homemade raku kiln. I have one made from a small galvanized trash can lined with ceramic fiber, and the burner was fabricated from a Kirby vacuum motor with a steel pipe and copper tubing, fueled by a small propane tank. I have been in workshops where the kiln was made from old refrigerator shelves lined with fiber and wired together to allow for flat storage, and fueled with WOOD. Check the various archives, and the great array of books and videos for sale here, there is a WEALTH of great info! Check out the multitude of websites online, many potters share their knowledge freely. YouTube also has lots of videos. I use an electric kiln exclusively for raku and have for several years. It produces excellent raku. With the tongs you don’t have to get over the kiln but you do have to plan how the vessels will be removed before you start the kiln. I often practice the removal. Wear a face shield and leather welders jacket and gloves of course. I use the same time schedule for firing as you would as any other glaze firing and can bisque in the bottom layers and do raku on the top. Since I do art pottery, I’m not concerned about the extra time required for firing as I’m not going for quantity. I also use an electric kiln and have for 5 years. I practice removal from the kiln before firing and have made several tools that aid in removal such as a long hook on a dowel and a double hook which I often use instead of tongs. For very large pieces, I also enlist an assistant with tongs to steady the piece. For about a year I used stoneware but started getting cracks in the pieces and switched to raku clay. This is a really helpful article! Thanks for sharing! Will be great if you can your knowledge and experience on builing Raku kiln at home…I have always fired in a top loading gas kiln.